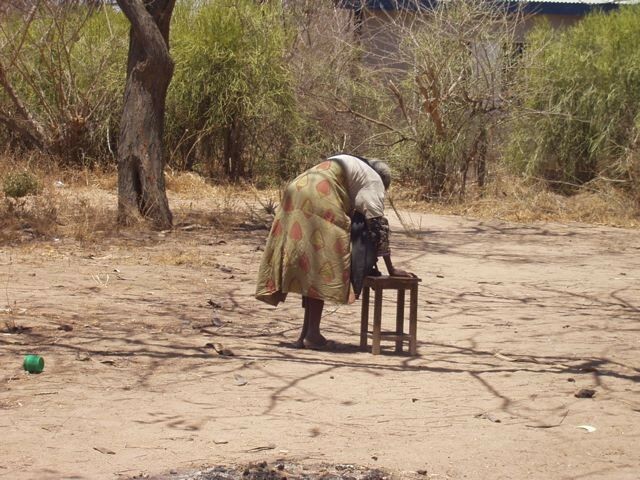 Hilda is a professor at Msalato Theological College who is monitoring the women with the Wilbur Project in Ikowa. You get to see Sandy McCann too. They are shaking hands following the service on Ash Wednesday. The tradition there is that when you exit the church and shake hands with those outside, you then join the line so that there is a huge circle of teachers, priests, volunteers and students with whom you give greetings. Jessie and I always cry when it is our last morning at chapel before we leave. There are more hugs than handshakes. Imagine all of the people one would meet and greet at our churches if we did that! 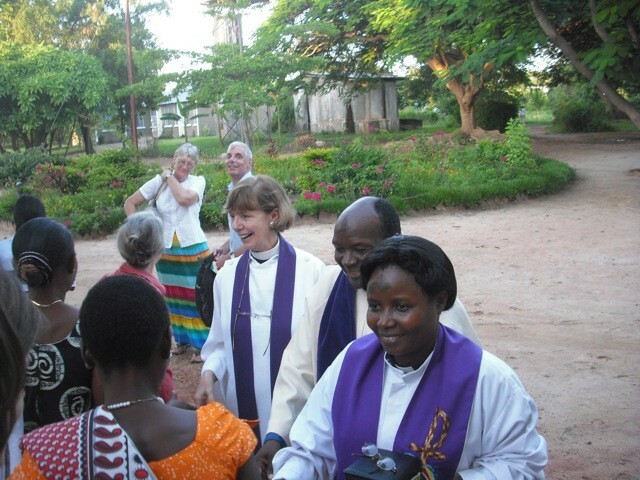 The small gray-haired lady with her back to the camera is The Rev. Lynn from Australia. She lived next door to us last summer. She is such a sprightly little thing ~ students were forever at her door and she would always stop what she was doing to help them. She teaches English and theology (I think). There is so much for us to learn from these people. The lovely green garden behind them is new to us ~ they are trying to spruce up the campus for their 50th anniversary this summer. They now have a bore hole and can water the plants and flowers sparingly. Don’t you think Hilda is beautiful? I do. 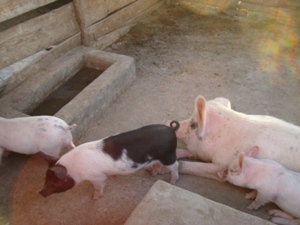 Okay, here is the skinny on the piglets. Moses and his wife Ruth came back this past Sunday night from Ikowa Village where we gave money for piglets. Their son David had taken the pictures but somehow hit the delete button. He was most embarrassed. The women were all there to show them their pigs. They visited 9 groups of women and their 9 pig pens. The women had bought 27 piglets with the money we gave them, thanks to you, and all were healthy other than one who was killed by a hyena two weeks ago. The hyena invaded 3 pigs in a pen but killed only one and the other two survived. The Rev. Dr. Hilda Kabia who helps the women manage the money spent two hours with the women working together in unity and with great determination. The thing that touched Jessie and me the most was that the women expressed their heartfelt thanks to YOU for this project which I call the “Wilbur Project ” saying they believe this will transform their lives for the better. Moses said they loved the pigs and manage them very well. He will go back to the village on Easter and said he would take pictures for us. The women want Jessie and me to visit them on our return in September so they can show us how fervent they have been in caring for their pigs. I see this as helping their children get an education. Education in Tanzania is free, however they have to provide the uniforms, books, paper and pencils. This meager project will benefit many and The Rev. Dr. Hilda is seeing that they pay back the original loan and keep the profits for themselves. The original money will be available to lend to other villages. It seems so small to us (less than $19.00 for a piglet) and yet a life changing possibility for the women we know in Ikowa Village and even those whom we don’t yet know. Isn’t it amazing that Jessie and I can pick up on each other’s writing when there is a need? Sisters in a way. She once gave me a book: “Just Sisters ~ You Mess With Her, You Mess With Me. I’ll try to send you a picture of The Rev. Hilda after the basketball game! It’s almost criminal to follow that lovely picture and lovely news of Sandy’s and Martin’s first grandchild, Briggs Freeman, but #1 I was trying to see if I could get another picture on the blog ~ ‘taint easy McGee (that dates me) and #2 I wanted to prove to you that necessity is the mother of invention. There are no “walkers” in the villages, and so they figure out how to get around the best they can without one. This is Hilda ~ I’m sure crippled with arthritis. She was a regular beggar at our door until last summer. Sandy said it was actually Hilda’s job to beg. She was grateful for anything, an egg, a chunk of bread, an orange, an onion, even yogurt one day. She tucked it into her kanga top against her breast and it must have been shockingly cold. We weren’t sure she knew what it was. Hilda has gone home to God now and she no longer needs a walker or a wheel chair. We had wonderful news from Moses today about the piglets and we are awaiting pictures. Jessie is dying to get them so she can write you about the success of the project. Stay tuned. Of course it means nothing to them, but most of us read Charlotte’s Web to our children or grandchildren and many of us were charmed by the movie. 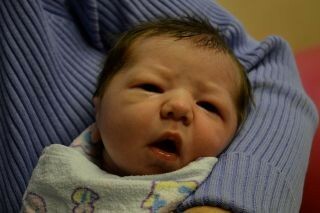 So I have named our piglet project: “The Wilbur Project.” More to come as soon as we get the pictures from Moses! “It’s about time,” I’ll bet you are saying. Our dear friends Sandy and Martin McCann are proud grandparents of Richard Briggs Freeman, born to their daughter Catherine and her husband Barry in Shanghai, China last week. The gifts that life holds for the wise. May the trees shake for him their blossoms down. We say a picture is worth a thousand words, but pictures can be deceiving. The picture that Jessie just posted looks green and lush. But look at the size of the corn. Their growing season is OVER. Even now if they get a little rain it is too late for the crops. They still need water for the lakes and cattle. Along with several pictures came a heart rending message from Sandy. Pendo, whom you see hoeing in the picture has a baby on her back and one sitting on the ground. Pendo works for Sandy and Martin during the morning. Her sisters, Sechee and Moti have been house girls for us when we are there. The pay is about $3.00 for a half days work which works out to about $28.00 for two weeks ~30,000 Tanzanian shillings. When Pendo finished her work with Sandy yesterday she came to her and said: “Sandy, I have no food in my house.” Sandy said she broke down as she said this. She was flabbergasted as just the night before she could hear Pendo singing as she hoed in Sandy’s yard. She sent her immediately to Moses who is selling bags of corn. Like here, everything is going up, up, up. Sandy said that gas was beyond belief and electricity has gone up 20% and food over 30%. A bag of rice is about 40,000TzS which I think is about $38.00. That’s a small bag. This is going to be a terrible year for our friends in Tanzania as it will be in Japan too. Tanzania will simply have no food. It’s a plain and simple and hard truth. The people at Holy Comforter gave us $660.00 in honor of their interim priest which we will ear mark for food in the village. Please, can you help at all? I have become a beggar.